Monastiraki is one of the most interesting places to visit when in Athens. Monastiraki, which means “little Monastery” was the site of one of the largest monasteries in Athens. The Monastery was demolished during archaeological excavations in the 19th century. It’s been three months since we came back to Athens as our house in Assini does not have any central heating and just the fireplace was not enough to keep the house warm during the winter. During the winter we usually stay in Athens for a few months and during our stay we would often go for walks in the city and had the chance to see Athens as tourists. We miss Assini and now that the weather is getting warmer, we’ve decided to go back next week and hopefully stay there until next winter. It’s almost impossible to go to the centre of Athens by car, unless you pay for private parking space, which costs a lot. However, if you are staying somewhere in the centre of Athens, most of the antiquities can be visited on foot. On one of those beautiful Greek, spring mornings, we took the bus and then the “metro” and headed towards Monastiraki Square (see map). Opposite the metro you will see an Ottoman Mosque, a relic of the Turkish occupation, built in 1759. Now, it houses the Museum of Ceramics, an annex of the Museum of Greek Folk Art. Getting out of the station, if you look opposite, on your left you can see the church of Pantanassa, dedicated to the Virgin Mary, which was built during the 17th century on the site of an older church built around the 10th century. The church was restored during 2007. Right next to the Mosque is the archaeological site of Hadrian’s Library. From the station we headed to the right and turning right again we walked down Adrianou street, where the archaeological site of the Ancient Agora is. Entering the Agora you can see and the Stoa of Attalos and the Acropolis in the background. Quoting from Wikipedia: The stoa is identified as a gift to the city of Athens for the education that Attalos received there. A dedicatory inscription on the architrave is engraved as built by Attalos II, ruler of Pergamon from 159 BC to 138 BC. The stoa was in frequent use until it was destroyed by the Heruli in 267. The ruins became part of a fortification wall, which made it easily seen in modern times. In the 1950s, the Stoa of Attalos was fully reconstructed and made into the Ancient Agora Museum. The two storey building was shut during the past 30 years and only opened last summer for the public. The characteristic feature of the museum is that the exhibits are all closely connected with the Athenian Democracy, as the Agora was the focus of the city’s public life. In the picture above you can see some of the artifacts displayed such as clay boots, cooking utensils, statues, jewellrybut of course there are many more for you to see there. The Temple of Hepaestus, also known as the Hephaisteion or earlier as the Theseion, is one of the best preserved ancient temples in Greece. It is located at the north-west side of the Agora of Athens, on top of the Agoraios Kolonos hill. From the 7th century until 1834, it served as the Greek Orthodox church of St. George Akamates. On the other side of Monastiraki station, if you turn to the right is Ifestou Street and at the end of the road is Avyssinias Square where you will find the flea market of Monastiraki, also known as Yioussourum, which was named after a Jew who has a store selling antiques there. 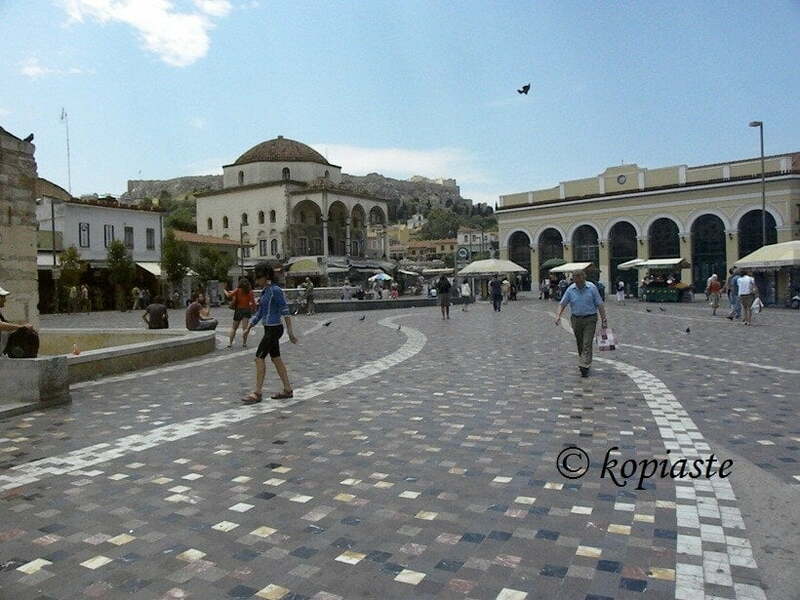 The streets around Monastiraki are full of tavernas, restaurants, caffeterias, souvenir shops etc. Part 2 will follow. It covers our visit to Anafiotika, which is a scenic tiny neighborhood of Athens, part of the old historical neighborhood called Plaka. Thanks for the lovely virtual visit of Athens’ Monastiraki quarter. I loved it! Love this post,Ivy! Thanks for sharing those beautiful pictures!Would love to visit one day!